Happy New Year to all my vistors and reader. ! Been a little while since I last posted as I have had a busy but refreshing Christmas break. I hope you all did as well. I managed to get out shooting quite a bit, which was nice. I hate it when I look back and feel like you have let some photography opportunities pass by. 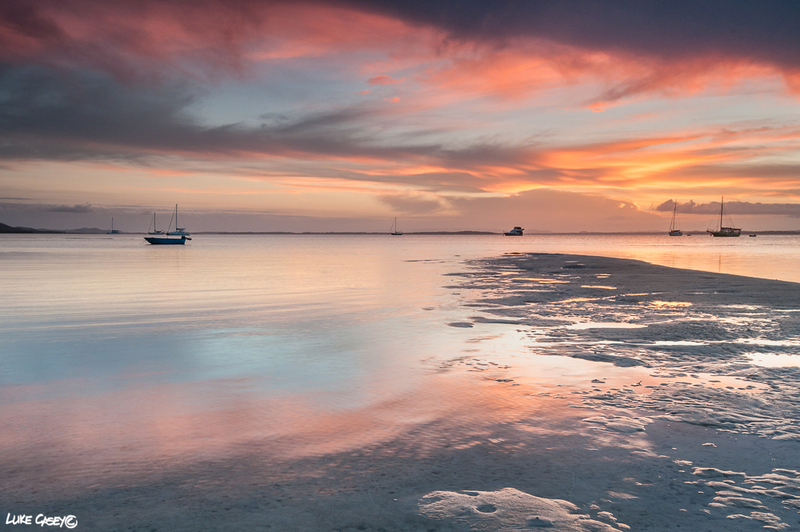 This one was taken at Adam’s beach on Stradbroke Island on a nice calm evening, on a low tide. The shallow water and lack of wind created a a nice calm mood and the skies showed some brief colours that worked well in the reflecting still water. Unfortunately the island has had some serious bush fire threats. Hopefully the situation will soon ease, for everyone involved. I like landscapes like this, I find I often return to shooting this style of landscapes.. Simple elements, nothing over complicated and a composition that bring all these natural elements together. My goal is to take the viewers eye on a relaxing path through the image. Hope it works out that way. Posted in Australia, Colours, Landscape, Nature, paradise, seascape, Stradbroke Island, sunset, Uncategorized, weatherTagged Adam's beach, beach, calm, colour, composition, elements, Landscape, Nature, pastel tones, pease, Queensland, reflection, seascape, simple, stradbroke island, Straddy, sunset, waterBookmark the permalink.